After a bit of inspiration, [Pete] decided to build a solid body electric guitar for himself. Instead of assembling a conglomeration of off-the-shelf parts, he plans on building just about everything from scratch. 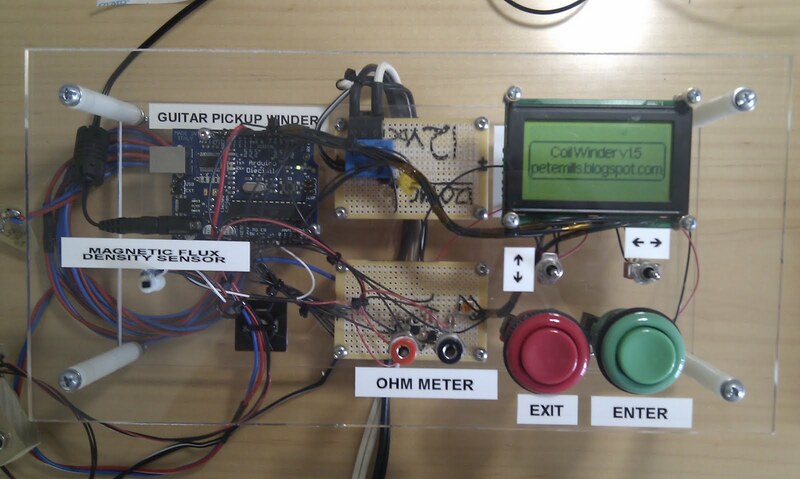 This includes the guitar pickups, so he built himself a pickup winder that has measures RPM, ETA until done, and auto stop for when the pickup is complete. Electric guitar pickups are simple devices – just a magnet for each string wrapped in thousands of turns of wire about as thin as a human hair. [Pete] began his build with a cheap sewing machine and added a tachometer and pickup mount. As an added bonus, [Pete] threw in an ohmmeter to measure the coil resistance and a Gauss meter to measure the magnetic flux and polarity of the pole pieces. It’s a very nice build that’s designed to be as functional as commercial pickup winders. [Pete] was originally inspired to build a pickup winder by the Les Paul Google doodle, and he plans on continuing Les Paul’s tradition of guitar innovation by building his own solid body guitar. The wood has been cut already, and we can’t wait to see the final product. Check out a video of [Pete]’s coil winder in action after the break. Very cool project. I look forward to seeing/hearing the final build. And it doesn’t have an arduino (yet)! I believe you may not have looked at the winder close enough. There is an arduino inside. I wound a custom pickup for a 3 string cigar box guitar using an electric drill. I used bird’s eye maple for the body of the pickup and wrapped it with 43ga wire. I estimated total number of turns and measured resistance to make sure I was in the ballpark range. No machines required. Not to take away from the creativity of the project, but if you’re making a (relatively) simple one-off item, why manufacture a machine to do it for you? I can see making this if you have multiple guitars lined up, but for one it’s overkill. I guess the reasoning behind making a proper machine is “because I can”. And because I can I feel I should. I used parts and materials I had on hand ( except for the sewing machine and consumables ). So, for very little expense and effort on my part I have a reliable machine for winding pickups. I shouldn’t need to worry about figiting around with the thing just to wind a pickup. As par as measuring the resistance to calculate the winds goes well, it is really irrelevant. We count the winds to estimate the resistance. See, the resistance is the goal and the gauge of wire determines the number of turns from there. I would also be wary of trying to calculate turns from resistance unless you compensate for temperature also. I found that the resistance of my pickup was ~200 ohms high right after winding due to friction from the tensioner. Good job making a cigar box guitar, I am sure it is fun to play! This WAS done with an old sewing machine. The sewing machine was purchased from a recycle center for $5. My “calculator” in this instance was an arduino. I value my calculators more than an old arduino collecting dust so I decided to utilize the arduino for this project. That was actually the hardest part; decoding “arduino” to get to the low level stuff I am interested in controlling. This is awesome! When I was 12 I made several very crude pickups. I used a fishing reel to spin the bobbins and hand-fed the wire. A very kind someone donated a spool of copper. Pretty darn thick for pickups at 38awg; so the output was pretty low despite the fact that I used mostly ceramic magnets. But they still sounded awesome. I am certainly putting a sewing machine on my ‘to scavenge’ list. Extremely well documented build. Great story. Be sure to pass on a spool of wire to some other curious kid when you get the chance. Thanks for the tip Jonathan. one winding for the 6 strings I think 1 bobbin per string is better? You may be on to something there. I was thinking about the same thing myself actually. Now that I have a winding setup, it should be trivial to make all sorts of pickup variants to test. If you want a truly unique guitar, you can always make the body out of poured concrete. Very cool Pete I look forward to trying this! Albeit without the awesome counter! About how many turns is that?